Customer Promos is an application that should not be kept installed on the system because it shows commercial advertisements only and does not do anything else. It has been observed that this program works on Mozilla Firefox and Internet Explorer browsers, which means that users of these browsers will not be able to hide from ads. It is not surprising at all that Customer Promos displays commercials because it is a typical ad-supported application (adware). It is known that it has replaced such programs as Blazer Deals, Gravity Space, Glass Bottle, Roaming Rate, Dragon Branch, and Strong Signal, so it acts in the same manner as these applications. In fact, all Injekt-based adware programs work like that, so if you ever encounter any of them, immediately go for the removal. Customer Promos is created on the same engine too, so we do not recommend keeping it installed. 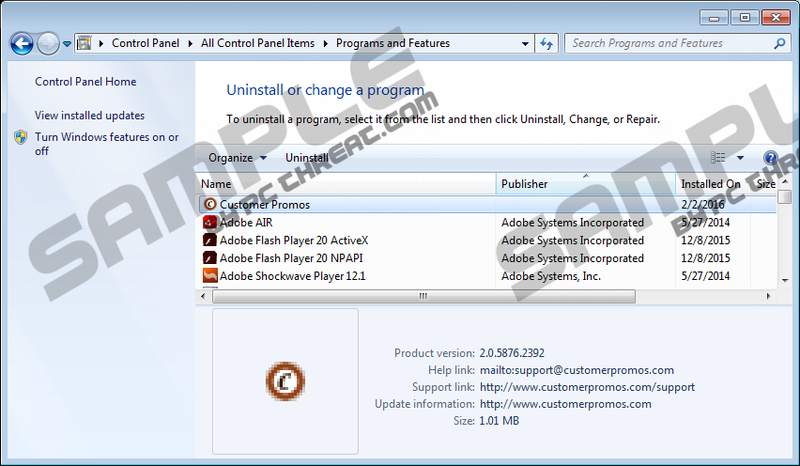 Users who have Internet Explorer, might not even notice that this program is installed for some time because it only appears in the list of Add-ons. Of course, more experienced users will definitely notice a new folder (Customer Promos) in %Program Files% (%Program Files(x86)%) and %Temp% directories. In addition, such registry keys as HKEY_LOCAL_MACHINE\SOFTWARE\Wow6432Node\CustomerPromos and HKEY_LOCAL_MACHINE\SOFTWARE\CustomerPromos will be created. Last but not least, all users will start seeing ads that will, most probably, have a label “Ads by Customer Promos” or “Brought by Customer Promos” sooner or later. Researchers working at pcthreat.com have observed that Customer Promos cannot be downloaded from its official website, but it is still very prevalent these days. The mystery has been solved when specialists have found out that this ad-supported program travels in software bundles together with other programs (e.g. freeware and shareware) and thus tends to enter systems rather secretly. The majority of programs created on the Injekt engine are distributed the same way, so we suggest being careful. If you want to be sure that your PC is safe, install a security tool. You should never download programs from third-party web pages ever again too. You should eliminate Customer Promos if you do not want to be taken to a corrupted web page one day and thus infect your system with malicious software. It will not be very difficult to get rid of this program, especially if you have tried erasing some kind of program via Control Panel previously. If you do not know anything about the malware removal, use instructions which you will find below to delete of Customer Promos and then take care of other infections that might hide on your PC. The other method to remove this ad-supported program is to scan the system with an automatic malware remover, such as SpyHunter. It will make sure that your system is 100% clean. Click Uninstall a program and right-click on the program you wish to remove. Right-click on the lower-left corner of the screen. Quick & tested solution for Customer Promos removal.